Washington: Louisiana Representative Steve Scalise was upgraded from "critical" to "serious condition" and continued to show signs of improvement after he was wounded in a shooting at a Republican baseball practice outside Washington. MedStar Washington Hospital Center released the update on behalf of the Scalise family on Saturday. The congressman underwent another surgery, and the hospital said he was more responsive and speaking with family. Scalise, the House majority whip, was one of five people shot when a gunman opened fire on Wednesday as the Republican team practiced in Alexandria, Virginia. He has required surgery several times since the shooting. 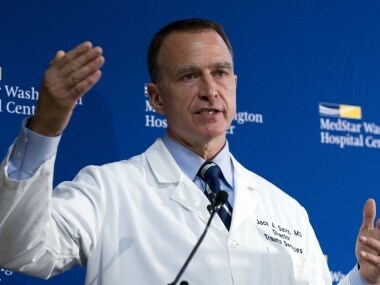 MedStar Washington Hospital Center Director of Trauma Dr Jack Sava speaks during a news conference in Washington. The person told AP on Saturday that investigators aren't sure of the significance of the names and don't know if it was a list of people he was targeting. This person was not authorized to speak publicly about the case and spoke on condition of anonymity. The person did not disclose the names, but said those listed had been briefed. Scalise's trauma surgeon said Friday he can hope to make an "excellent recovery," even though the lawmaker arrived at the hospital Wednesday at imminent risk of death. Dr Jack Sava of MedStar Washington Hospital Center said it's a "good possibility" that the Louisiana Republican will be able to return to work in his full capacity. Sava declined to put a timeline on when that would happen or when Scalise would be able to leave the hospital. The doctor described how a bullet from an assault rifle entered Scalise's hip and traversed his pelvis, shattering blood vessels, bones and internal organs along the way. Scalise, the third ranking House Republican, arrived at the hospital via helicopter in shock, with intense internal bleeding, Sava said.